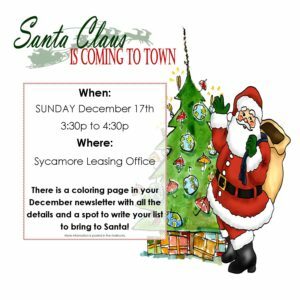 Give the Holiday a Fresh and Exciting Start with Santa Claus at Sycamore Terrace Apartments in Temecula, CA! Come to celebrate the holiday with us. Bring your little ones and enjoy a delightful early Christmas celebration with Santa Claus! Sunday, December 17 from 3:30 to 4:30 pm. Witness how Santa Claus brings fun and laughter to your holiday this year! Here at Sycamore Terrace, we believe that Christmas is not just for kids, but also for the young at heart! As part of our yearly tradition, we are giving you again the privilege to have a fun-filled early Christmas celebration at Sycamore Terrace Apartments in Temecula. It’s always fun to see how the kids relate to Santa and it offers an opportunity to connect with other residents who may have grown distant over the past year. As our loyal residents, we value your family’s enjoyment and satisfaction. Get a chance to take pictures with Santa Clause. Bring your kids, and let them revel in Santa’s little surprises. Listen to his classic stories, and let him take you back to your youthful days! Get that perfect shot with Santa Claus for your Christmas card, family album, or #MerryChristmas post on social media! Christmas season is about giving, receiving, and making other people smile. This celebration is your chance to get to know other residents, develop a deeper sense of belonging, and reinforce your connection with other community and family members. Our community is strong and you may be inspired to join us in fun Christmas activities. Sing along to your favorite Christmas songs, complete your family’s wish list, still in time to finish shopping, and fill your eyes with beautiful decorations. Be part of the holiday fun and spread happiness with us here at Sycamore Terrace! Help us cultivate a sense of community while sharing the holiday delight with children of all ages. Also happening this year, Sycamore Terrace is running a canned food drive benefitting the Community Mission of Hope in Temecula. 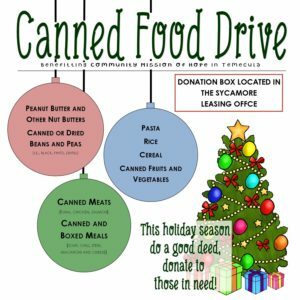 The donation box is accepting canned and boxed foods and you can bring your donations to the leasing office any day of the week between 9am and 5pm. Sycamore Terrace Apartments is committed to bringing the community together and helping in times of need. Take part in giving back this year and donate to the canned food drive today! Sycamore Terrace Apartments in Temecula, CA is dedicated to giving its residents a fun-filled and interesting lifestyle. Experience the joy of celebrating every special occasion and the comfort of living with style in our newly remodeled and furnished apartments. Explore our different amenities and enjoy hassle-free living! Do you also need help with on-site property management and maintenance? We at Sycamore Terrace are always here to help you! See for yourself the joy and sense of community that we can offer you. Sign up on our blog to know more and get the latest updates.